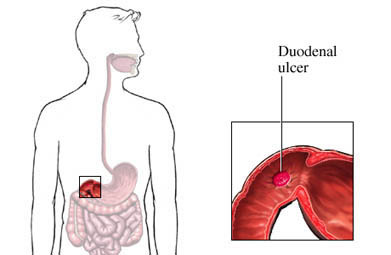 Peptic ulcers are eroded areas in the stomach (gastric ulcers) or first part of the intestine (duodenal ulcers). Ulcers occur in areas where the lining of the stomach or intestine is worn away and irritated, causing pain, or bleeding. Normally, a mucous coating protects the lining of the stomach and the intestine. This coating can be disrupted by a bacterial infection from Helicobacter pylori (H. pylori) or by irritating medications, such as nonsteroidal anti-inflammatory drugs (NSAIDs). When this mucous coat is disrupted, strong digestive juices can erode the lining underneath it. This causes the ulcer. Lifestyle factors such as diet and stress were once thought to be responsible for causing ulcers. However, now we know that the vast majority of ulcers are due to H. pylori infection or NSAID use. Perforation—If an ulcer eats through the entire wall of your stomach or intestine, it is called a perforated ulcer. This is a very serious and potentially life-threatening condition, since the hole allows the contents of your stomach and intestine to leak out into the abdominal cavity. Obstruction—Scarring from ulcers can block flow through the stomach and/or duodenum. This can cause repeated vomiting, weight loss, and intense pain. Stomach cancer—People who have had peptic ulcers due to H. pylori have a higher rate of stomach cancer. Many more people are infected with H. pylori than ever develop an ulcer. It is not known why some people infected with this kind of bacteria develop ulcers while others don’t. It is also not known how people become infected with H. pylori. It may be passed in food or water. It also seems to live in the saliva of infected people, allowing the bacteria to be passed through kissing, for example. 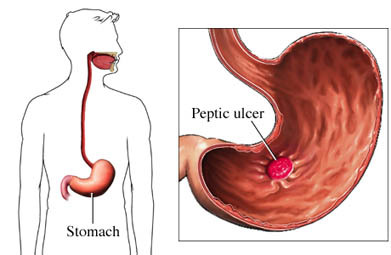 What are the risk factors for peptic ulcer disease?What are the symptoms of peptic ulcer disease?How is peptic ulcer disease diagnosed?What are the treatments for peptic ulcer disease?Are there screening tests for peptic ulcer disease?How can I reduce my risk of peptic ulcer disease?What questions should I ask my doctor?Where can I get more information about peptic ulcer disease? Peptic ulcer disease. EBSCO DynaMed Plus website. Available at: http://www.dynamed.com/topics/dmp~AN~T116374/Peptic-ulcer-disease. Updated May 11, 2015. Accessed January 12, 2017. Peptic ulcer disease. Merck Manual Professional Version website. Available at: http://www.merckmanuals.com/professional/gastrointestinal-disorders/gastritis-and-peptic-ulcer-disease/peptic-ulcer-disease. Updated May 2014. Accessed January 12, 2017.